I came across some remarkable historical photos on the PBS American Experience site. I believe these were connected with the release of the documentary film “The Amish” in 2012, but I missed them the first time around. There are a total of 13 shots in the gallery which you can view in full, and in larger sizes, here. I pulled a few of my favorites and shared those below, with a few comments. I found something fascinating about each of these. This first photo has a ghostly quality. This is the Millcreek School in Stormstown, PA. The year is 1923. 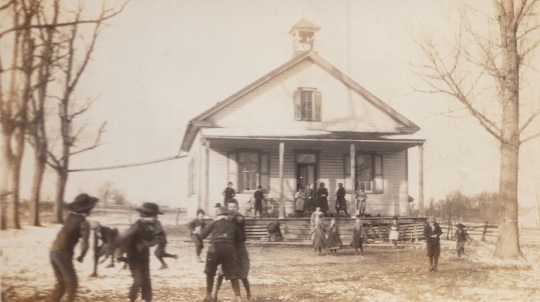 Though it appear very similar to a modern-day Amish school, this would be a public school of the time. 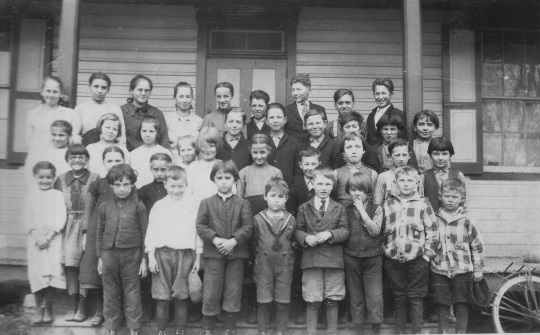 The first parochial Amish school was established two years later, in the Dover, Delaware Amish settlement. Looks like the photographer caught the children frolicking at recess, or maybe before the school day began. Photo: Landis Valley Museum. This one was taken in 1938, just a year before World War II broke out and three years before the US entered the fight. The non-resistant Amish did not fight in the war, but did alternative civilian public service. It’s from a National Geographic pictorial on the PA Dutch. From the way the items are laid out on the table and the way the boys are standing around, it feels quite artificially staged in a picture-perfect sort of way, almost like something out of a museum or exhibit. Back to 1927 for another shot from the Millcreek school. This is the school photo, and you can see it is a mixed group of kids, just looking at the clothing and haircuts. You see ties on some of the non-Amish boys, and the two on the front right must be brothers as they look to be wearing matching plaid shirts. It looks to be about a 50/50 mix of Amish/English children. And look at that, even back in 1927 kids loved making funny faces for the camera. Amish in some communities attend public schools today. One of the best examples is the East Holmes School District in Holmes County, Ohio, which has heavy Amish attendance. This photo is also from the Landis Valley Museum. 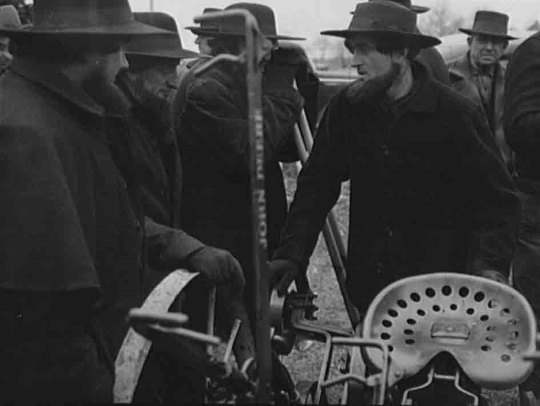 Next we have some Amish men at an auction in Lancaster County in 1942. What caught my attention here was the beard on the fellow on the right (it seems so robust and juts out at such an angle where it appears you could almost set a coffee mug on it). And I also got to wondering what these guys are talking about – milk prices? An upcoming wedding? Or maybe just plows? You can see that men’s dress is similar today, but the hat brims here seem wider to me. The photo credit here and for the next shot goes to the US Farm Security Administration/Office of War Information, Library of Congress. 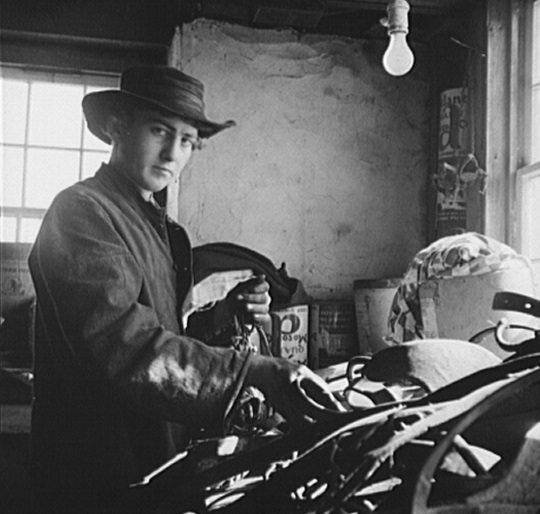 Here is a young Amish fellow in a barn, circa 1942. He looks like he’s posing for the shot. Also note the light bulb. Maybe this is not an Amish place. Amish are known not to pose for the camera, but sometimes they do. Finally, one last school photo, also from National Geographic. This one is from Lancaster County, 1938. The colors in some of these old photos have a dreamlike quality. The American Experience site caption explains that the children’s Mennonite teacher (or teachers?) stands on the stoop. A game of softball in a heavily-overgrown schoolyard. Don’t they have a sheep that can mow that for them? 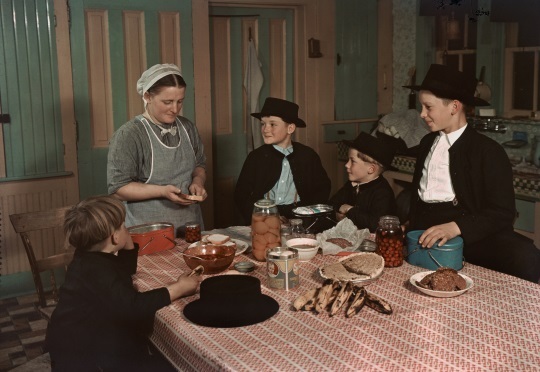 The game remains popular among Amish schoolchildren today. Old photos never get old, so to speak. I hope you enjoyed these. Thanks for sharing these, Erik. I really enjoy old photos no matter where they originate. The angular beard on that one guy must have been quite a crumb-catcher! Interesting, I didn’t think about colorization, maybe so. They look real enough to step into the scene,but with an ever so slightly artificial quality. That’s the best I can describe it. Old colorized footage or films can have an eerier quality to it than this. Anyway I really like that last school shot and I wonder what became of the building, if it still stands. Our present Day society needs to remember these good ol’ days and keep them going. Life would be much better. Amen. The Amish do not seem camera shy in these pictures. Why are they now camera shy? Good question. I can’t say for certain, but it might have been that in the 1930s and 1940s, photography wasn’t as widespread a technology, and Amish at the time had not formulated as strong opinions on it as they do today in a selfie look-at-me era. Thanks for sharing these. I agree that old color photos get erier looking with age. I have some from the 70s of my children that have a strange look. Done by professionals as well. My mother used add color to pictures for photography studios. I am not sure of the kind of paint but she applied it with cotton balls, then shaded and highlighted with more cotton palls and cotton wrapped around a pointed orange stick for details. I would sit for hours watching her. The thing I can’t figure out, is if the photos themselves change, or our perception of them is what changes? Maybe these colors and tones are what looked normal at the time, and as quality has changed and improved, they take on that “eerie” look. … looks like it might be of the same fellow. Anyway … maybe he was engaged to be married to an Amish girl and was in the process of learning the ways and converting. I thought you’d enjoy the other photos here as well (I like the OLD GULF gas station photo (also from 1942). (these were all taken by a photographer in 1942 by the name of John Colier). The photos it finds (the ones that were taken by John Collier) appear to all be from the same farm in Honey Brook, Pennsylvania (vicinity) — the farm field of Morris Zook, Jr., Amish FSA (Farm Security Administration) client. So maybe the young man eventually married into the Morris Zook, Jr family and became Amish.